This 1/2 to 3/4 court trapping press has given us more difficulty than any other press we've seen (most of which we break fairly easily). If you have three quick athletes (X1, X2 and X3) who play aggressively, this press can work for you, with only a minimum risk of giving up a lay-up. See diagram A. The point defender X1 will come out beyond the half-court line and contain the dribbler and force the ball toward one sideline. X1 doesn't need to be tight on the ball at this point, but just contain it and direct it toward the side. X1 will close in tight as the ball approaches the half-court line. As the ball is dribbled up the side, X3 reads this and slides to the middle, looking to intercept any pass to the middle. X4 slides toward the sideline to intercept a pass up the sideline. X5 must read the offense and if there is an offensive player deep, must be a safety against the deep pass. If no-one goes deep, X5 can cheat up and toward the middle. If O1 crosses half-court with the dribble, X1 and X2 stop the ball and trap there. Ideally, you want to "invite" the ball to come just beyond the half-court line where you can use the half-court line and the sideline to help complete the trap. So ordinarily you do not want X2 to come across the line (unless it's necessary to stop a cross-over dribble move toward the middle). Now let's say that before crossing half-court, O1 passes laterally to another player (O2) who then attacks up the opposite side (Diagram B). In this case, X3 plays the ball, X1 sprints over to help and trap, X2 slides to the middle to intercept any pass in the middle, X5 cheats toward the ball-side sideline, and X4 is the safety (but again, may cheat up and in the middle if no offensive player goes deep). After the pass to O2, X1 should really apply pressure and get the hands up in the passing lane, to prevent the lateral pass back to O1. Once O2 crosses half-court, this lateral pass is really not an easy pass and can easily go "over-and-back" across the half-court line, especially if good pressure is put on the passer. Looking at the lateral pass again in Diagram B, if the offense seems to be favoring a lateral pass to O2, sometimes X1 can anticipate this pass and actually get into that passing lane, deflect the pass, intercept and take it in for an easy lay-up. In summary... it's a matter of keeping the ball out of the middle, and stopping it along the sidelines. When the ball is dribbled up the sideline, the defender denying the middle pass (X2) should not leave to trap until the weakside top defender (X3) can get there to deny that middle pass. This takes some quickness and anticipation from the top three defenders... quickness, long arms and athleticism. 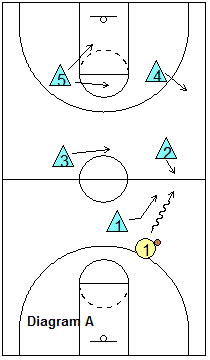 The two bottom players (X4 and X5) have to stop the pass to the high post and ballside sideline, and give help to stop the dribble when the press is beaten. This press can cause nightmares for the offense if it is well-executed (I know from experience)!